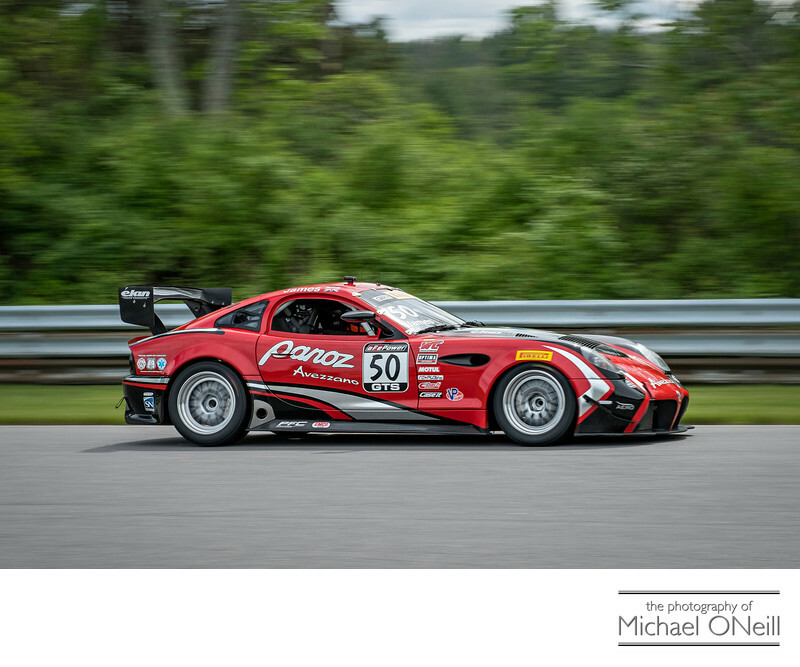 This beautiful specimen of a Panoz Avezzano race car was photographed on the back stretch of Lime Rock Park in northeast Connecticut. The car was participating in The Pirelli World Challenge (PWC) race series on Memorial Day weekend of 2017… the 28th season of this prestigious road racing series. Using an advanced motion blur photographic technique enabled me to capture the sensation of the speeds that these cars travel at while isolating the vehicle from the background to make it stand out. Of all the motorsports events I cover, Road Racing, be it automobiles or motorcycles, is my favorite. I have covered motorsports events for NASCAR (Mello Yello Drag Racing Series), NHRA, The Pirelli World Challenge, The IMSA WeatherTech Sports Car Series, the Loudon Road Race Series, The Championship Cup Series, The Monster Energy Monster Jam and MotoAmerica. I have created images at Lime Rock, Watkins Glen International, New Hampshire Motor Speedway (NHMS), New Jersey Motorsports Park, New York’s Nassau Coliseum, New England Dragway in Epping, NH and Old Bridge Township Raceway Park in Englishtown, NJ. My unique background as a portrait photographer enables me to notably document the action but also to capture the personalities involved in the sport be it drivers, team members, team owners and sponsor representatives. Though a great deal of my motorsports work has been done in the northeast United States, closer to my studio on Long Island, NY, I am available for editorial, advertising and public relations assignments anywhere in the world. Give me a call with your needs and ideas. I would love to collaborate with you on your next project.